"I kick it in the face." -Robert E. Howard. "I didn't care what it had to say anyway." -Robert E. Howard. The first Maze of the Minotaur was so awesome, that we had to keep it going one! 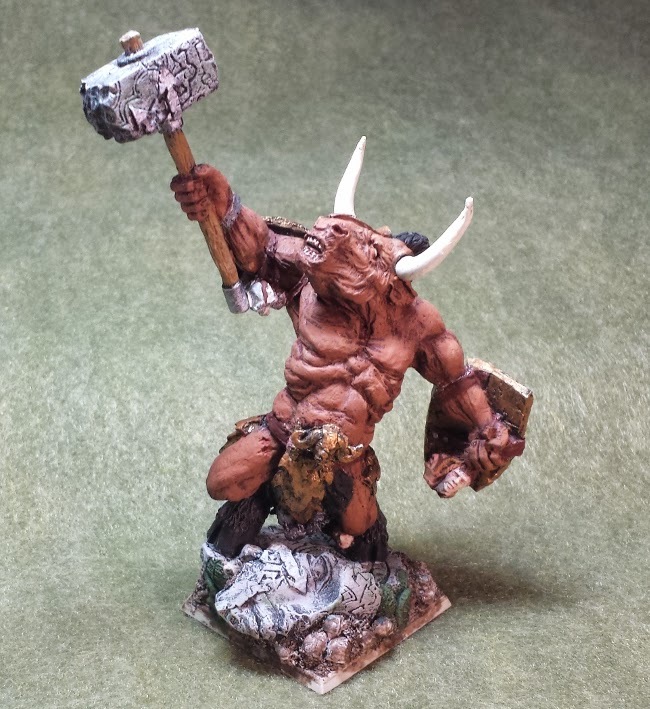 Our tale begins when the two Barbarian Brothers were again summoned by the king and asked to preform a dangerous task: A second minotaur in a labyrinth in a neighbouring kingdom had grown too powerful, and like the last one, it would need to dealt with. It was up to the brothers to save the day once again. Scene 1 The New Dungeon. The Nymph. The Wolves. The First Key. The journey to the town with the next labyrinth was a swift one, and the brothers found it along the coast. This labyrinth was less of a constructed dungeon and more a series of caves and tunnels in the cliff face that had been re-purposed into a labyrinth. The ground was rough where the brothers entered, and the salty smell of the sea filled their nostrils. They wasted no time, and ran head long into the dungeon seeking their prey. The first room they entered was not what they expected. rather than the rough stone walls, and slime covered floor, this room was full of lush foliage, as though an explosion of life had wrought its way out of the dank chambers. The brothers searched the area, and found little other than grass and ferns, until they found a small island in the center of the room. Laying on the island was an enchantingly beautiful woman. ... It was a nymph. Upon seeing the two Barbarians the nymph startled, opened a portal and crossed through it. The brother's couldn't take their eyes off of her! So enchanting was her beauty that they didn't even notice the wolves that had amassed behind them... Until they attacked. The barbarians quickly dealt with the wolves, which caused a secret panel to open in the room revealing the first of three keys they would need to leave the maze. Claiming their prize, the two left the room and continued their hunt. The next room they found was filled with dark, foul smelling water. The two slowly crossed it, finding shallow areas to step across to the door on the other side of the chamber. About halfway across the waters began to bubble and churn and eight horrific fish men rose from the deep. It's called a Skum for a reason. 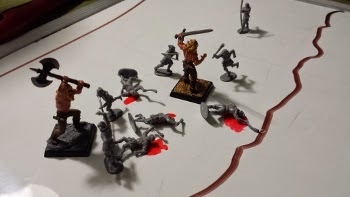 The horrible creatures stunned the barbarians and struck in their moment of weakness, but again the Skum we easy prey and fell quickly before their blades. Leaving the eight stinking corpses behind them, Raymond and Robert crossed through the muck left through the next door. Scene 3 The Troglodytes. The Minotaur Speaks. The way is Blocked. The hall opened up into a cliff side ledge, revealing the sea ebbing and flowing below. Watching their footing, the pair of barbarians walked along the edge still hunting their prey. The barbarians easily dealt with wretched creatures and dumped their bodies off the ledge to warn any more of them below. They were about to continue on their way, when they saw the minotaur standing in the passage way on the opposite cliff ledge. The Minotaur taunted the two brothers, claiming they would die in here. but the brothers paid it no mind and insulted the Minotaur's mother. Still challenging the minotaur, the two ran along the edge trying to get at the creature, when the ledge closed off into a short hallway ending at a closed door. Robert opened it slowly, only to slam it shut when he saw the piercing eyes of what he thought was a dragon. 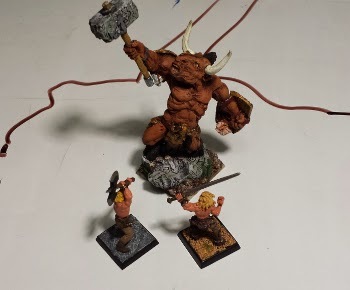 He told his brother they needed to find another way around, but the minotaur who was still taunting them from across the chasm had something else in mind. With a great cry, the beast slammed his fists against the wall causing the whole dungeon to shake, and rocks to come falling down from the ceiling. When the ground was done shaking, the barbarians' way back was blocked by boulder's too large for either of them to lift. They were trapped between a rock and a hard place. Scene 4 A Rest. The Wyvern. The Second Key. Deciding this was as safe a place as any, the two barbarians decided to rest and heal up for the night, setting up their humble camp between the Door and the rocks. After a solid night's sleep, the two barbarians felt ready to face the dragon behind the door, and charged into the beast's chamber with a furious cry. 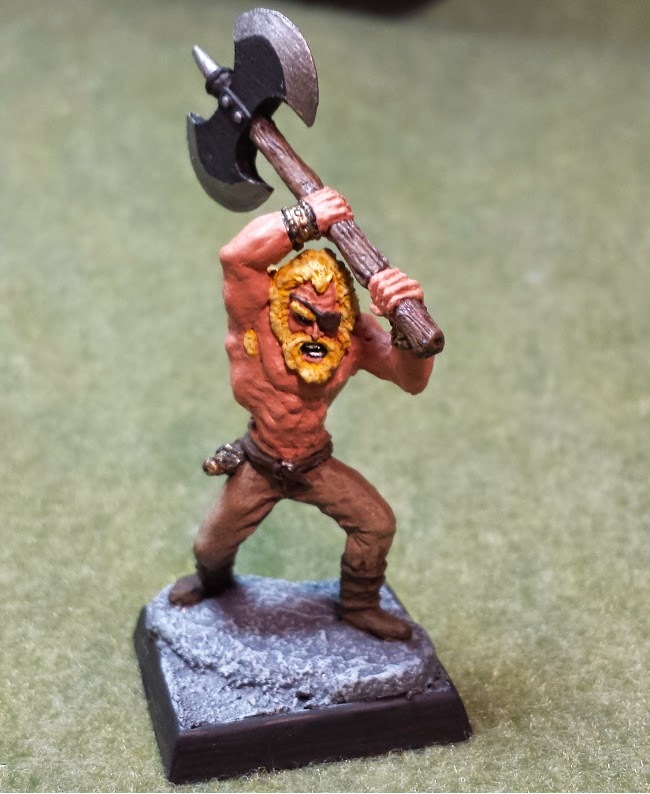 The monster had been sleeping and the warriors caught it off guard, shocking it back into the realm of consciousness with blows from their Great Axe and Great Sword. The beast uncurled itself and let out a great roar. 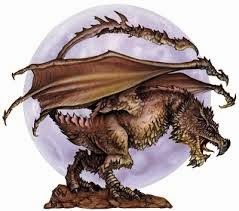 This was no dragon but one of it's less powerful cousins, a Wyvern, and it had the second key around it's neck. The fight was long and bloody. But in the end the strength of the Howard Brothers could not be redoubted. With axe and sword they hacked the beast to pieces while dodging it's own ferocious blows. Turns out we actually had a small dragon mini. In the end the barbarians emerged victorious and claimed the second key from the Wyvern. Scene 5 Attack of the Troglodytes. 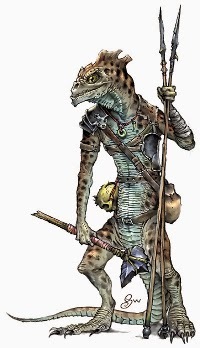 Leaving the Wyvern room behind, the halls again opened into another ledge along a cliff over looking the waters below. The Barbarians were pretty sure they had scared any remaining troglodytes off, but they were wrong. Trogs are really easy to kill. 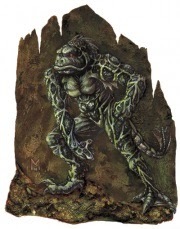 The Troglodytes scaled the walls attacking this time in a party of ten. But their stone weaponry was not match for the Barbarian's steel and the brothers slew as easily as the first time. Again they dumped their corpse back into the ravine, hoping to warn off any further attempts. Just beyond the stains of troglodyte blood, the door leading to the next chamber stood; swollen with water, and stubbornly stuck in the archway. After throwing their weight against it, the door finally gave way to the brothers, opening into another room filled with water to the ankles. This time their foe was not hidden like the skums, and two sea cats lounged on shallow rocks and readied themselves to fight as soon as the warriors entered. Yup, they are pretty weird. The Sea Cats rolled off of their resting places and into the water, There they moved as fast and as gracefully as sharks. 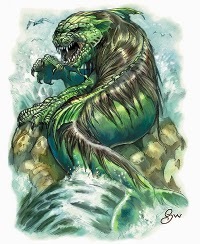 There was no way the two barbarians could fight these beast in the water, and there was simply not enough solid ground to put up a good struggle. They had only one option: run. 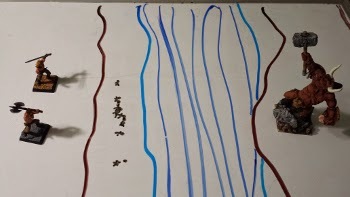 Robert and Raymond dashed across the room, leaping from island to island, dodging the blows of the Sea Cats as they leapt from the water and tried to pull them under. But they were too fast for the cats, and managed to make their way across the room, slamming the door behind them. Scene 7 Return of the Troglodytes. Again the Hall opened out onto another cliff edge, and the sound of chittering echoed from the cliffs edge. The troglodytes weren't ready to give up yet. Twelve more the things climbed over the edge, brandishing their stone weapons. The barbarians laughed and charged into the fray with a mighty war cry! There's the sea, and the Trog village below, and the battle up on the cliff. The barbarians won the day and tossed the the twelve corpses back from whence they came. The sweetness of victory turned bitter as the adrenaline wore off and the wounds from the Troglodytes began to take their effect. 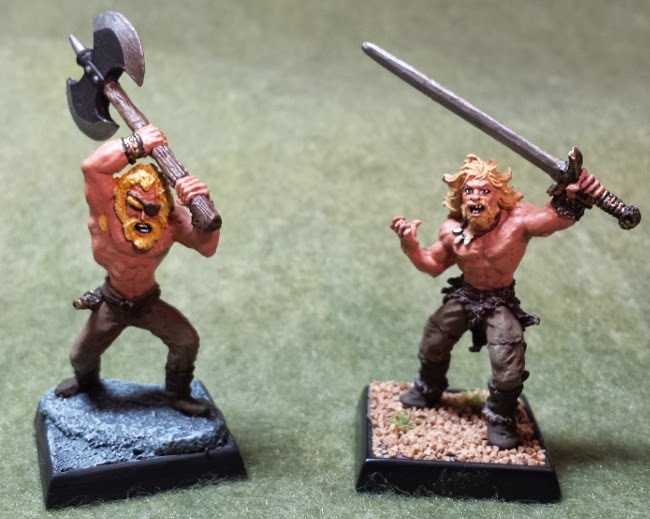 The sheer number of troglodytes had proved enough to do some damage to the barbarian Brothers, and both work looking worse for wear. The rough cuts from the stone blades were bleeding profusely, and they would need to rest again soon. Seeking some refuge the brothers entered a sealed room, and found a chest in the middle of it. 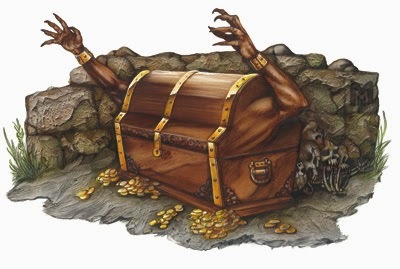 It seemed suspicious, but any hope of healing magic was enough to make Robert open the chest. Unsurprisingly, the chest burst alive and attacked him knocking him to the ground as its first bite tore deeply into his flesh. Seeing his brother's distress, Raymond swung his axe and split the creature in two, killing it instantly. The red ooze of healing potions leaked out from it. their prize had been destroyed. Robert thanked Raymond, but he was too frustrated top listen. They had lost their only hope for healing. In anger, Raymond kicked the wall. a loud click resonated from where his foot and struck, and then a small compartment embedded in the wall fell open. inside there were a couple of health potions and he an Robert each drank one. With a few hit points recovered the two continued their rampage through the dungeon. Scene 9 Facing the Minotaur. The Third Key. Around corners they ran, and down passage ways new and old the sprinted, until they found a central chamber. They paused for a moment to decide where to go next. but their deliberations were disrupted by a deep and rumbling laugh. From the darkness of one of the passage ways, the minotaur stepped into view. He held a great axe in his hand, and on his belt swung a brilliant glowing sword. With great grins on their faces, Raymond and Robert rushed at the beast swinging their blades. The battle was quick, ending in four blows. 2 from Robert, Two from Raymond Turns out one standard monster manual minotaur is not powerful enough to deal with two level 6 barbarians. Live and learn. As the minotaur lay dying, Elijah was about to give it i's final words and here is where we our quote of the evening was born. With the beast unceremoniously slain the Barbarians cried out in victory. Deciding to rest and roast the creatures flesh yet again, Raymond set about to making a fire while Robert began carving another minotaur skull bowl. Among the Minotaur's possessions were the Third key, and a Vorpal Long Sword. Robert took the sword and lashed it to his belt. It would be nice to have a second weapon. The smell of roasting Minotaur Flesh was enough to keep any of the labyrinth's creatures at bay. After a night's rest, the brothers awoke and continued their quest. They had slain the minotaur and uncovered all three keys. Now they had to find their way out of here. The two ran around the maze finding places they had already been, when they came across a shut door. they opened to find it full of spider webs. They knew this creature. A Dryder. Using an old tactic, Robert grappled the creature while Raymond butchered it with his axe. Nothing would stop them now. Scene 11 The Octopus. A Dead End. A Creative but Futile Solution. 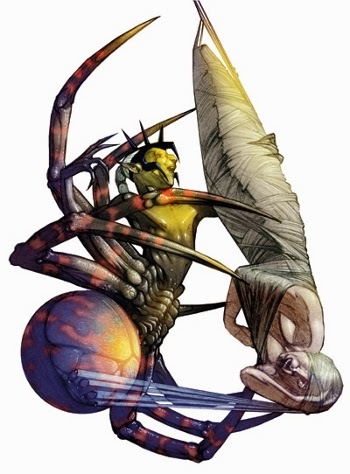 Leaving the Drider, the path took them to another shut door. Robert kicked it opened, revealing a deep pool, across which was a high platform. Shinging up there was the godlen door with three keys. It was the way out. 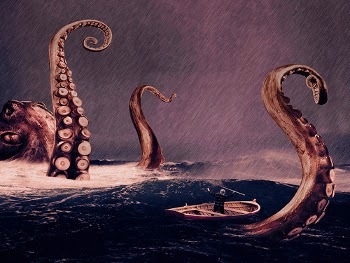 The two brothers charged into the water, only to be stopped as a massive tentacle rose out from beneath. Terrified, the two ran out of the room and slammed the door behind them. It bumped and creaked behind them as the octupus' tentacles bashed against the door. 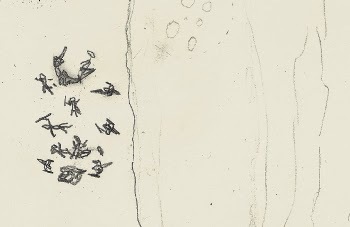 For a while Robert and Raymond entertained the idea of cutting off the Creatures tentacles, lashing them to their arms and then using the suction cups to scale the wall. But not having a safe place to battle the creature from, the brothers abandoned that plan and ran as fast as they could away from the room with the octopus. After what seemed like hours of wandering, Robert and Raymond finally found the path that lead to the golden door and the way out. They put their three keys in the lock and opened the door to the roaring crowds. There, they met with the king who bestowed upon the two a powerful artifact, telling them that they would need it in their quest to slay all the minotaurs int the land. Next time Elijah will need to make the minotaur a lot stronger if he wants it to be a real challenge. And there will definitely be a next time! We were given some incredible gear... Which can only mean that difficult times are ahead! In what dungeon will we fight next? What foes will we face? And when will we find ourselves in the next Maze of the Minotaur! ?